Preparing Acorn Squash: Roasted of Course! I am a huge fan of this delicious little nugget of flavor, vitamins, and minerals. I love the diversity, nutrition, and satisfied feeling after eating just half. I recently found out how I can create a yummy, savory, and a healthy version of the season’s delight: Roasted acorn squash with rosemary. I was at the farmers market the other day and have been eating mainly vegan/vegetarian based home prepared meals and saw the deep green, acorn-shaped little guy calling out to me. Typically, acorn squash is my go-to ‘dessert-dinner’. What’s a dessert dinner? When you satisfy the nutrition and sweet-tooth at the same time of course! My typical preparation would be to slice it in half (*), scoop out seeds, place on baking sheet, lined with aluminum (scooped side facing up). In the hollowed-out cavity, I throw in dried cranberries, brown sugar, cinnamon, a little water, and butter. I also put thin pats of butter on the perimeter and sprinkle with cinnamon. Halfway through the roasting (bake at 400 degrees) 20 minutes or so later it will be soft enough to pierce with a fork and I puncture all around the inside so the flavors ooze into the flesh. Total cook time is around 45 minutes. Truly decadent, yummy and satisfying … but loaded with fat and sugar. I have been very mindful, recently having gained a few pounds, to clean up my act a bit more. I typically eat well, but not perfectly, and knew I was not going to make this in my normal way. When I got my acorn squash home I said to myself, “now how am I going to prepare you with a healthy twist?” Since I always loved the sweet, naughty version described above, I tried another direction: Let’s go savory! (*) If this is your first encounter cutting one open, be prepared the slicing takes some muscle and be careful. My goals were for this recipe were for it to be low in fat, and it’d better be tasty! I cut and prepared as above, however, I took each half and sliced into ¾ – ½ inch slices that looked like moon crescents. Coated both sides lightly with olive oil, placed on a baking sheet lined with aluminum, and sprinkled with Himalayan pink salt, black pepper, and rosemary, to taste. Bake for about 45 minutes at 400 degrees, flipping the slices halfway through the cook. Broil for a minute or two at the end if you like additional browning. Super deliciousness! Try it. I am sure you will love it. 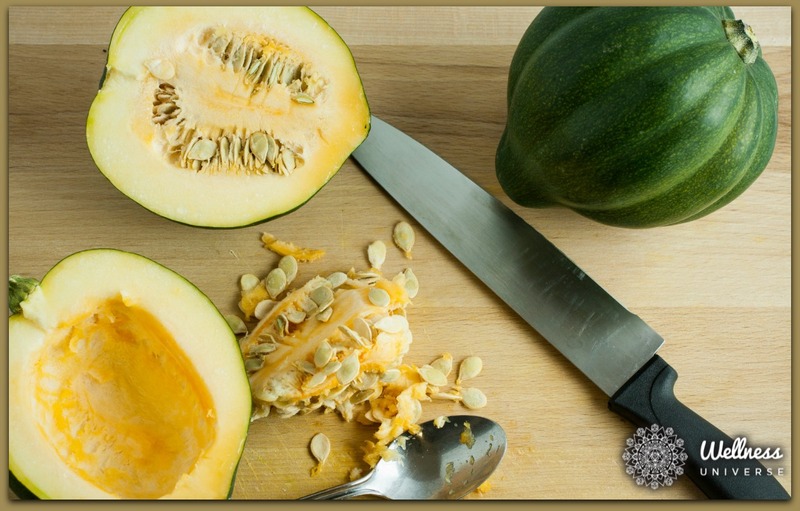 What are the Nutritional Benefits of an Acorn Squash? Acorn squash is inexpensive, and one of those veggies you can prepare in literally thousands of ways. Due to their shape, you can stuff them, roast them, make soup, prepare and season them for any pallet from sweet to spicy to savory, and it all works! Have you ever tried an acorn squash? If so, what is your favorite way to prepare it? Please share your tips and tricks in the comments section below!